Osaka’s Koraibashi (高麗橋) was first built during the time of Toyotomi Hideyoshi (1536-1598). One of only 12 government controlled bridges in Osaka, it crossed the Higashi-Yokoborigawa canal, the outermost moat of Toyotomi’s massive castle, which was completed in 1598. Koraibashi was placed in such a way that the immense castle tower could be seen from the bridge. Connecting the castle grounds with the merchant district of Senba (船場), the bridge played an exceedingly important role during most of Osaka’s history. Koraibashi is believed to have been named after the Korean missions which walked across it on the way to the castle during the time of Toyotomi. A Korean embassy is also thought to have existed in the vicinity. Initially, guard towers (矢倉, yagura) were built on both sides to control traffic. The yagura on the east side soon disappeared, but those on the west side remained and passed into the hands of merchants who used them as stores. At least one of these two survived until the Taisho Period (1912-1926). 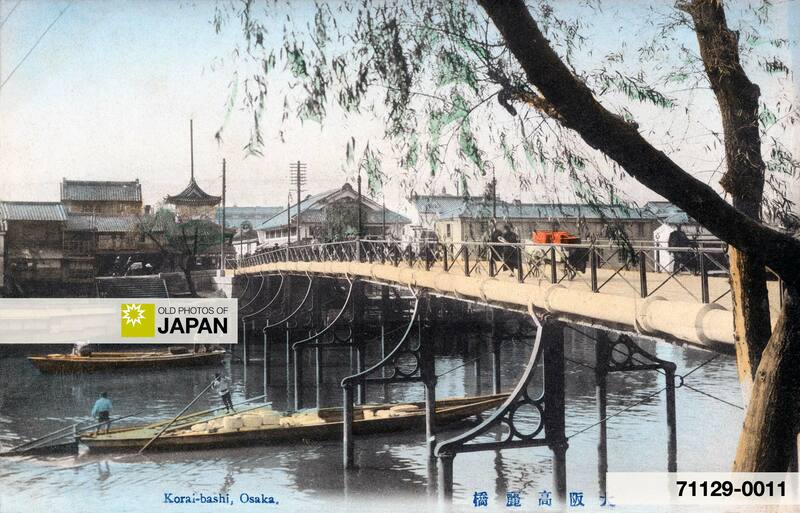 On this postcard, it can be seen on the left hand side of the bridge. Koraibashi was literally the center of the city. It was the starting point and terminus of two major highways, the Chugoku Kaido, which connected Osaka to Kokura in Kyushu, and the Kyokaido (京街道), which was an extension of the famed Tokaido, connecting Edo (current Tokyo) with Kyoto. In 1876 (Meiji 9) a zero milestone, called ritengenpyou (里程元標跡), was established here to certify that all measurements started from the bridge. How important the bridge was, and how busy the area, can be seen from the fact that a kosatsu (高札), a huge board used for official government proclamations, was placed on the north-west side of Koraibashi. Many people meant many shops. During the Edo Period, a Mitsui dry-goods store (三井呉服店) was established here for example, and Osaka’s money exchange (両替商) was located here as well. As a result, the nearby merchant area of Senba would become the home of many wealthy merchants. This would eventually inspire Japanese author Junichiro Tanizaki to place the origins of the once-wealthy Makioka family in this area in his famous book Sasame Yuki (The Makioka Sisters). On the above postcard, stone steps leading from the river to the street can be seen next to the bridge. These were built to more easily load and unload boats filled with merchandise. A few of such boats are actually visible on this image. In 1929 (Showa 4), the iron bridge was replaced with a concrete structure. In those days the water was still clean. People would fish here and nearby indigo (藍色) dyed textile was washed in the canal. It is very difficult to imagine now when you see the dirty waters of today. Some of the storehouses with thick (earthen) walls (土蔵) managed to survive until the early Showa Period (1926-1989). But eventually the old buildings and the special atmosphere of the place disappeared. An elevated highway was built over the canal and the new concrete bridge and it is now a dark and brooding place, which makes you feel uncomfortable to linger. 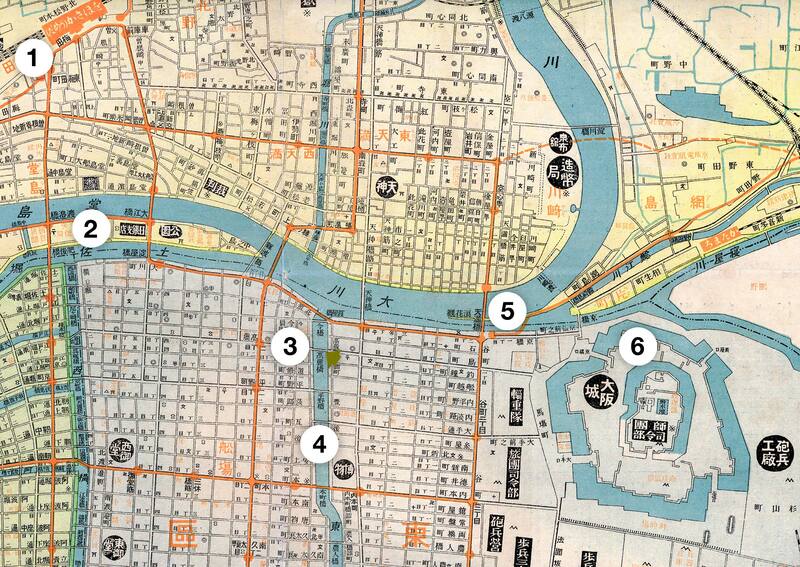 1 High-definition Image Database of Old Photographs of Japan. Bridge over the East Yokobori River. Retrieved on 2008-10-22. You can also licence this image online: 71129-0011 @ MeijiShowa.com.